How can damaged cardiac tissue following a heart attack best be treated with replacement muscle cells? A team of researchers under the guidance of the University of Bonn is now presenting a novel approach on mice: muscle replacement cells loaded with magnetic nanoparticles will take over the function of the damaged tissue. Within the damaged heart muscle, these nanoparticle-loaded replacement cells are injected and kept in place by a magnet, allowing the cells graft better onto the existing heart tissue. The scientists used the animal model to demonstrate that this innovative method considerably improves heart function. Biomaterials, the specialist journal, presents the study results online, and the print version will be published shortly. During a heart attack, clots often lead to constant circulatory problems in areas of the heart muscle, ultimately causing the death of heart muscle cells. Over the years, efforts have been made to revitalize the damaged tissue of the heart with replacement cells. "However, most of the cells are pushed out of the puncture channel during the injection due to the pumping action of the beating heart", explains Prof. Dr. Wilhelm Röll from the Department of Cardiac Surgery at University Hospital Bonn. As a result, only a small number of spare cells remain in the heart muscle, meaning that heart repair is rather limited. With an interdisciplinary research team, Professor Röll tested a novel method on how to make sure that the replacement cells injected into the damaged heart muscle continue to remain in the preferred location and engraft onto the existing heart tissue. The experiments were carried out on mice that had already suffered a heart attack. EGFP expressing cells harvested from mouse stem cells or fetal mouse hearts were used to better follow the replacement of cardiac muscles. Loaded with small magnetic nanoparticles, these fluorescent muscle cells were injected via a fine cannula into the damaged heart tissue of the mice. 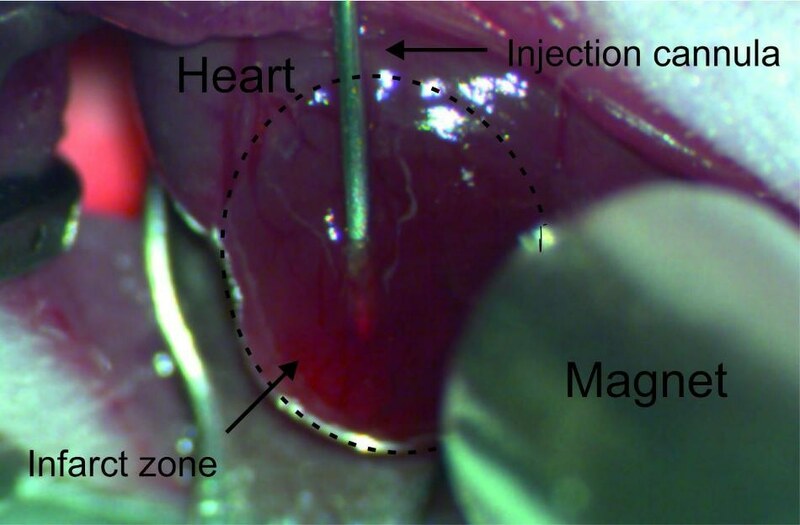 In some rodents that were treated this way, a magnet was located at a distance of a few millimeters from the heart’s surface to ensure that a large part of the nanoparticle-loaded replacement cells stayed at the preferred site. "Without a magnet, about a quarter of the added cells remained in the heart tissue, with a magnet, about 60 percent of them stayed in place", reports Dr. Annika Ottersbach, who was a PhD student in Professor Röll's team during the project. Just 10 minutes under the effect of the magnetic field was more than enough to keep a considerable amount of nanoparticle-loaded muscle replacement cells at the site of interest. In the following days after the procedure, the injected replacement cells stayed in place and slowly attached themselves to the existing heart tissue. "This is surprising, especially since the infarct tissue is relatively undersupplied due to poor perfusion", says Prof. Röll. Under the effect of the magnetic field, the muscle replacement cells did not die as often, multiplied more, and engrafted better. The team explored the reasons for the enhanced growth: It was discovered that due to the more intensive cell-cell interaction these implanted heart muscle cells were packed more closely and thus could survive better. In addition, the gene activity of various survival functions, for example cellular respiration, was observed to be higher than without a magnet in these muscle replacement cells. The team also showed that mice treated with nanoparticle muscle cells in tandem with a magnet had significantly improved cardiac function. "After two weeks, seven times as many replacement muscle cells survived, and after two months, four times as many compared to conventional implantation technology", reports Prof. Röll. Since mice have a maximum lifespan of two years, this is a remarkably long lasting effect. In the research group 917 "Nanoparticle-based targeting of gene and cell-based therapies" funded by the Deutsche Forschungsgemeinschaft (German Research Foundation), various disciplines worked together, spanning from biology, medicine, and physics to engineering. "This interdisciplinary approach facilitated the unusually broad spectrum and depth of the investigations", says Prof. Röll. According to the researchers, this latest technology could also be applied to humans. Prof. Röll: "However, there is still a long way to go, and intensive further research is required before this method can be used in a clinical setting."